Update: Today Only Save 50% off Tickets in Celebration of National Cookie Day! Generally speaking, I am a savory kinda’ chick. Give me meat, potatoes, bacon and some more meat, and we will be the best of friends. Enter the holidays, and I can’t seem to stuff enough pumpkin and peppermint flavored sugary delights in my face, leaving me in a raging sugar coma only to be countered by booze. This, my dear friends, is where LA Weekly’s Sips and Sweets event warms my heart, as the second annual shindig will be serving up sweets and sips from LA’s top bakeries and bars, paired with shopping. Now, booze and shopping together can be tricky. It can be tough. It can be a flat-out nightmare for your wallet…. Sign. Me. Up. Funny story: I once had the greatest booze-induced shopping spree. After consuming pitchers (yes, plural) of margaritas at a local Mexican restaurant, I somehow ended up drunk at Pottery Barn, where I randomly purchased a GIANT, extremely heavy iced tea pitcher, then made my way to Macy’s where I sat in the dressing room. Pant-less. For about an hour. 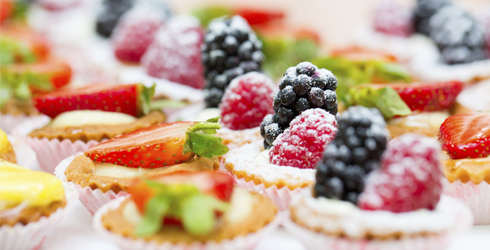 Sips and Sweets will have bites from favorites such as Mc Conell’s Ice Cream, Belcampo Meat Co., Salt’s Cure, Broken Spanish and more. Sips will be poured from awesome places such as Butchers and Barbers, Terrine, Corazon y Miel, Birch Faith and Flower and others. The event will take place on December 12th, 2015 from 8pm-11pm at The REEF 1933 S. Broadway Los Angeles, with VIP hour from 7pm-8pm. Tickets go on sale to the public on October 5th at 10am, however I have a presale code that will not only get ya’ a ticket before anyone else, it will also save you some dough, which of course you can turn around and spend at the event (God help me if there’s iced tea pitchers to purchase…). Use my exclusive presale code SIPSBEAN to snag your tickets HERE! 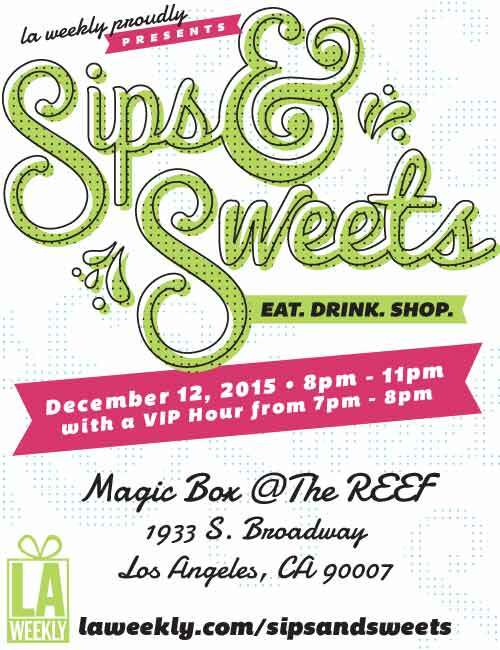 LA Weekly has graciously invited me to attend the Sips and Sweets event as media. All opinions, like always, are my own.